Don’t let the alarmists scare you—this isn’t a debate about food safety. There are risks associated with raw milk, just like there are risks associated with everything that we do in life. There are many great resources out there for you to research, so I won’t begin to tackle whether or not raw milk is “safe” to drink. If you are interested in learning more about raw milk safety, visit The Campaign for Real Milk. The problem with pasteurized milk is that, like so much of the food we put into our bodies, it is dead. The nutrients have literally been cooked out of it. If you allow pasteurized milk to spoil in your refrigerator, you know exactly what it smells like—totally, utterly horrible. Raw milk, on the other hand, is a living entity. As time progresses, it sours, but it never spoils. After using raw milk a few years now, I can’t imagine going back to pasteurized milk. I think I would just eliminate milk entirely from my diet before doing so. I grew up thinking I was lactose intolerant. It wasn’t until I started drinking raw milk that I realized the pasteurization process was killing what my body needed to digest raw milk. I’m infinitely healthier since making the switch a few years back. I’ve talked with many folks who have had similar health changes upon using raw milk. What Other Risks Should We Avoid? What’s more disturbing is that milk was only the beginning. In most states, apple cider must be pasteurized. Now, the trend is for pasteurized eggs. With all the recent E. coli outbreaks linked to spinach, will it soon be illegal to eat raw veggies? The problem with pasteurizing milk to protect consumers is that it eliminates the rights of the consumer to choose what goes into their bodies. If I have the right to buy tobacco (which research has shown repeatedly is dangerous, addictive, and without health benefits), why don’t I have the right to buy raw milk? I am shocked at how many educated, intelligent folks refuse to hear out the research on raw milk. They think that whether or not a few fringe folks are allowed to buy raw milk is irrelevant to them. I know in my own life, most people think I am a little crazy for wanting to buy it. They truly believe it should be illegal to protect everyone from rampant illness. Irregardless of your stance on raw milk or whether or not you want to drink it, you should be fighting for the right of others to drink raw milk. This is a freedom issue. People should be allowed to make an informed decision without fear of government intervention. 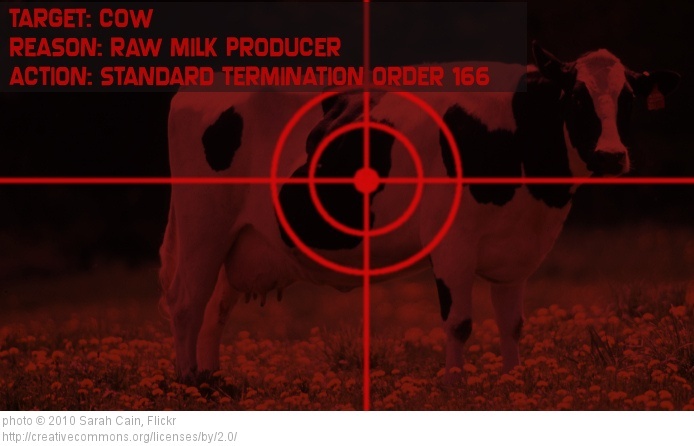 In a country where everything from elective surgeries to riding motorcycles is legal, why would selling raw milk be a crime? Could it be that the dairy lobby has pushed for these unnecessary mandates that are not in the best interest of the consumer? How Can Real Food—Living Food—Win? With the dismissal in federal court of a lawsuit undertaken by a consortium of organic growers against Monsanto today, the fight for real food has sustained another loss. It’s bad enough that we are allowing Monsanto to produce, sell, and FEED us genetically modified food. It’s worse that it can contaminate our own organic farms, rendering them essentially useless. It’s the equivalent of agricultural second hand smoke. Let me be clear: I don’t hate dairy farmers. I sympathize with the plight of the small family farm and understand why many don’t want to legalize raw milk. It can be dangerous. Cows and milk must all be handled with extra care when it will be consumed raw. But shouldn’t we be doing that anyway? Don’t we want to put the most nutritious food into our bodies that we can—including milk from grass-fed cows that have not been over milked or confined? If we don’t choose to become aware of the issues and let our voices be heard, we will continue to loose our food rights one small court decision at a time. So what’s your stance on raw milk? What do you think a viable solution and compromise is on this issue? One important group that is fighting the fight is the Farm to Consumer Legal Defense Fund. A consumer membership is only $50 a year. Anyone who has a vested interest in food rights (which should be every American citizen) should be a member. They are also a great resource of information regarding the food battle, especially as it relates to raw milk. ← previous post Join the Garden Party!